In the online age, many organisations are facing both internal and external disruption, resulting in leaders who are actively searching for methods to deliver increased digital value. Every business is striving to gain a competitive advantage from their investment and it can be difficult to determine just where you should be directing your efforts. Here are our tips on how to make sure your digital marketing strategies create higher revenue growth and margins. The CEO Must be an Advocate for Digital. In today’s online society digital is what makes your vision, reality. Thus, digital is of vital importance to every area of the business. It appears that this message is being taken on board. The majority of CEO’s today actively lead the charge on the importance of digital marketing to the business. It is a necessity and CEO’s need to be creating their business strategy around digital, not the other way around. On top of this, the CEO’s attitude will set the tone for the entire executive line-up and thus, the wider team. If your CEO isn’t converted yet, they need to be. If you are your entire executive team, then the good news is that you should already be doing this. 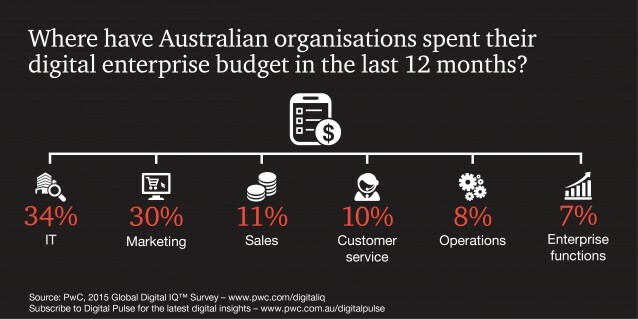 PwC’s annual Digital IQ Survey uncovered that on a global basis, CEO’s are 5 times more likely to focus on disruption than CDO’s, leaving huge potential for plans to fall apart. Every member of the executive team has to be on the same page with it comes to digital. By ensuring this, you will maximise the value of your investments as well as making it more likely that you will identify anything that could adversely affect your strategy. Engage with external parties to utilise their insights and agility on technology. Many organisations are reaching out to those looking from the outside in, in a bid to find solutions to challenges, gain inspiration and react to disruptive technology. Connect with the community via Face Book, Twitter, Instagram and any other way that works for your business. There is an entire world full of people with valuable insights. Use them. Actively look for emerging technology that can assist you in growing your business. While it can be difficult to know which step to take first, the priority will always be anything that is going to maximise your growth. Strategically speaking, technology for data mining, data analysis and cyber security are almost always going to be at the top end of your list. It’s not enough to capture data – all the data in the world does you no good if it sits in a vault. Pull it out, dust it off and use it! Businesses who understand the value of the data they gain will work to extract every ounce of value from it. The biggest barrier to success is a lack of the skill to interpret said data. If you’re unsure, speak to an expert, just don’t let it go to waste. If you don’t know where you’re going, you’re never going to get there. The biggest challenge to growing your revenues via digital marketing is not having a clear plan that details what you want to accomplish and how you plan to accomplish it. There’s always scope to update a roadmap as the digital landscape changes, but you need to have something in place. Any business that invests in digital marketing & tech is going to want evidence that the investment was a sound decision. When comparing your results against your roadmap, don’t forget to measure increased customer satisfaction. Traditional metrics such as ROI and increased revenue only tell part of the story where digital is concerned – cyber security, improved brand awareness and customer satisfaction are all valuable outcomes of your investment. Digital investment is a necessity in todays marketing landscape and is frequently the difference between mere survival and stratospheric success. Think of the most successful businesses that you know – chances are, they all have a digital marketing strategy that is executed with meticulous care. If you need some help with your digital marketing, why not contact us today to find out how we can help?